as i have shared earlier in my previous post https://indiandotnet.wordpress.com/2013/07/17/how-to-generate-xsd-from-xml-in-2-minutes/ . 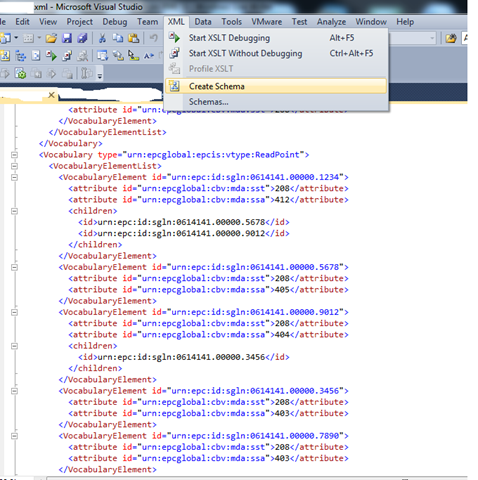 When you open XML in the visual studio in the menu you will get XML option. Just click on create Schema submenu and you are good to go. How to generate XSD from XML in 2 minutes ? When you run it it will generate the XSD file in system32 folder. sometimes you need to create dynamic form in asp.net . Let see below example to understand it more clearly. When you run above code you will find on LoginAuthentication.ashx folder you are getting accessToken there. Windows 8.1 & VS 2013 – WOW lets go for it. Microsoft Shared in build 2013 about latest creation which is Windows 8.1 & VS 2013. How to invoke a Java script after completion of server event of asp.net control ? Sometime you fall in this situation where you need to invoke a java script just after your server event of asp.net control. Lets understand with an example suppose you have a asp.net server control button on your web page now after clicking this button page will post back and everything is added in database and then after you need to show Java script alert like Record is Saved successfully. Here the important note is to register the script with unique name. I hope this will help you also.